Cardiff’s latest hotel and restaurant offering marked its official opening with a visit from the Lord Mayor of Cardiff. Restfull nights are proud to associated with indigo hotel Cardiff have supplied all of the 122 new beds. 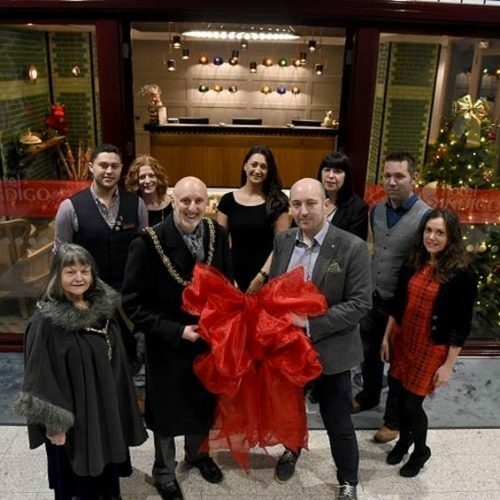 Councillor Bob Derbyshire helped mark the opening of Hotel Indigo Cardiff, managed by Redefine|BDL Hotels (RBH), the UK’s leading independent hotel management company, on Monday 11th December with a ribbon cutting ceremony. The Mayor received a tour of the newly built hotel before cutting the ribbon alongside the hotel’s general manager, Tom Gaskell, and other members of the hotel team. Hotel Indigo Cardiff’s General Manager, Tom Gaskell, said: “I would like to thank the Lord Mayor of Cardiff for taking the time to visit the hotel and help us mark its official opening. We were really proud to show him around so he could see what Hotel Indigo Cardiff will bring to the city, and we welcome him back anytime for a visit. The 122 bedroom hotel boasts beautifully decorated guest rooms which were designed to highlight three recurring themes – made in Wales, Welsh industries and music – underlining the heritage synonymous with the local area and beyond. The hotel is also home to Marco Pierre White’s famous Steakhouse Bar & Grill restaurant, which is the only one in the country. It is located close to Cardiff’s business district and with easy access to major attractions such as Cardiff Castle and the Principality Stadium, both adventurous guests wishing to explore the city or those who prefer to relax in the boutique surroundings of the hotel are well-catered.